A localized habitat specialist (AOO <10 km²), potentially threatened by habitat loss and degradation. Western Little Karoo between Barrydale and Riversdale. Quartz pebble outcrops in Apronveld. This species is not browsed by livestock, but is sensitive to trampling (Vlok and Schutte-Vlok 2010). One subpopulation is potentially vulnerable to road construction (N.A. Helme pers. obs.). Salsola verdoorniae is locally abundant in suitable habitat (Vlok and Schutte-Vlok 2010). Bochantsev, V.P. 1974. 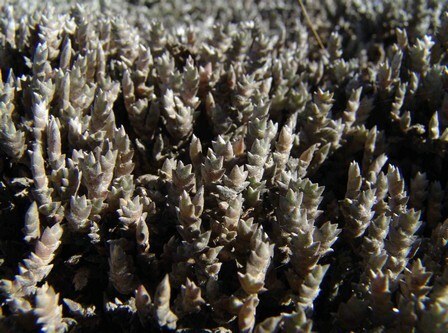 A synopsis of Salsola (Chenopodiaceae) from South and South-west Africa. Kew Bulletin 29(3):597-561. Tölken, H.R. 1973. A new species of Salsola. Journal of South African Botany 39(3):233-234.